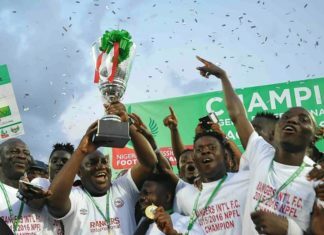 Nigeria’s representatives at the CAF Confederation Cup, Enugu Rangers have taken a step forward to qualify for the money-spinning group stage of the CAF Confederation Cup. Also called the flying antelopes, Rangers defeated their hosts, Bantu FC of Lesotho 2-1 in Maseru on Sunday. The return leg will be played in Enugu on January 20 with the overall winners advancing to the mini-league stage of the competition. Bright Silas scored the first goal for the Flying Antelopes early in the first half to record his fourth goal of the competition. The Nigerians doubled their advantage midway in the second half when Godwin Aguda made it double. The hosts however secured a consolation goal in the second half. The second leg encounter comes up in Enugu 20th of January. The Nigerians are expected to consolidate on the away win to book a ticket in the group stage of the tournament.